Satellite Parts – POPACS – Petersen Inc.
POPACS (Polar Orbiting Passive Atmospheric Calibration Spheres) project – the main objective of the overall product is to measure the changes in density of the auroral zone upper atmosphere, in response to various solar stimuli, such as flares and CMEs. The spacers were machined to print using aluminum bar stock. 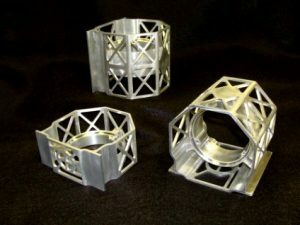 5-Axis machining was used to produce these spacers. Exact measurements were required for dimension and alignment for connection to each piece.